Peter Ndlovu was brought to the English Premier League by Terry Butcher to play for Coventry City. It was at Coventry City that Peter was arguably at the zenith of his footballing career playing 179 games and scoring 41 goals in the process. His stint at Coventry would prove to be the longest compared to other teams in the Premier League. The Zimbabwean international became the first opposition player to score a treble at Anfield since Terry Allcock of Norwich in 1961 when he single-handedly won the points for Coventry in this surprise 3-2 victory. 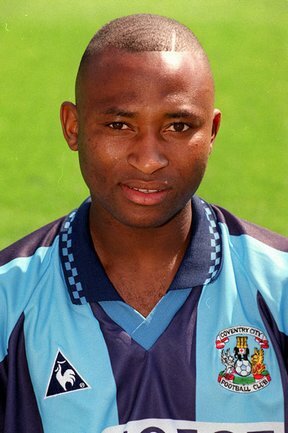 The teenage Ndlovu scored the winner against Arsenal at Highbury on his Coventry debut in August 1991. He scored some very important goals for Coventry City and was the first player in thirty years to score three goals against Liverpool Football Club at Anfield. Several top English teams like Manchester United are said to have been interested in the player at one point with Arsenal having four a million bid for the player turned down by Coventry City. Previous articleCan you Identify Them?